The 2nd Air Division Memorial Library grew from funds raised in 1945 by 2nd Air Division personnel, which were placed under the care of the Memorial Trust of the 2nd Air Division USAAF. In 1963, eighteen years after those original funds were raised, the 2nd Air Division Memorial Room was opened to the public, in the new Norwich Central Library. The dedication of the 2nd Air Division Memorial Room took place on June 13, 1963. The Memorial Room contained a Roll of Honor, as well as a collection of books on various aspects of American life. In addition, a Memorial Fountain, complete with stones from all 50 states in the United States, was built outside the Memorial Room. On August 1, 1994, a devastating fire broke out, levelling the entire Norwich Central Library. With few exceptions, only the records deposited with the Norfolk Record Office, located in the basement, escaped the fire. All of the books and display items in the 2nd Air Division Memorial Room, including uniforms, photographs, and anything else on display or on the shelves of the Memorial Room, were lost to the flames. The Memorial Library was moved to temporary quarters until it’s new home in the Norfolk and Norwich Millennium Library at The Forum located in the heart of Norwich, was opened on 1st November 2001. Many veterans of the 2nd Air Division came to Norwich, which was selected as the venue for their annual convention that year, to mark the occasion. 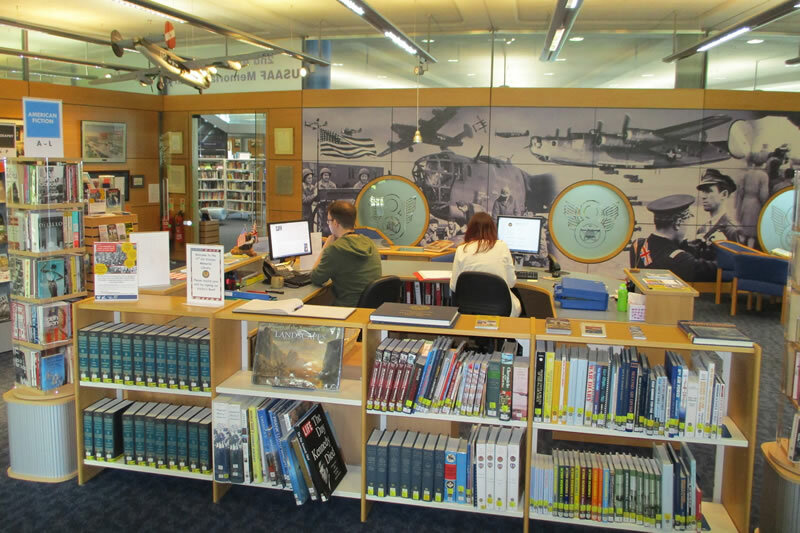 Today the Library has a lending collection of over 4000 books covering all aspects of American life and culture as well as a specialist collection devoted to the history of the 2nd Air Division. The library archive also includes papers, photographs, and other material relating to the 2nd Air Division.